Morph: Customizable Fly-Out WordPress Menu - CODELISTPRO | Free Premium Scripts, Plugins, Apps Source Code. 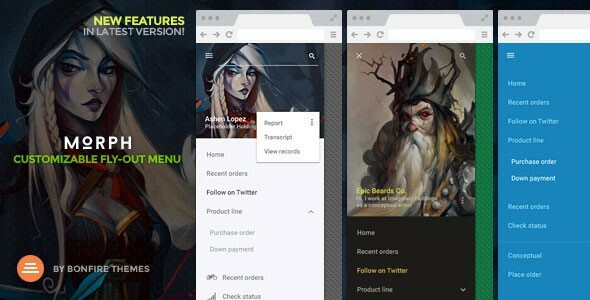 Morph is an easy-to-setup fly-out mobile menu for WordPress. While designed primarily as a mobile menu, it works wonderfully on both desktop and touch devices, and can be set to be shown at specified resolutions only, meaning – if you so wish – it can easily be used as a mobile-only or desktop-only menu.